A Wall Mounted Holder For Five Gallon Buckets. Store And Organize The Small Stuff. Stuff Points: Earn 90 points when you buy this stuff. Bins for balls, containers for tools, a spot for random hardware and so much more. This rack is the perfect storage solution for any home handyman, but it's also great for families because it can store anything from sidewalk chalk to paint rollers. Once it's loaded up, everything inside will be easy to see, simple to retrieve, and most importantly, off the floor, and out of your way. Store and organize all of the small stuff that's currently rolling around on your garage floor, or cluttering the corners of your basement. 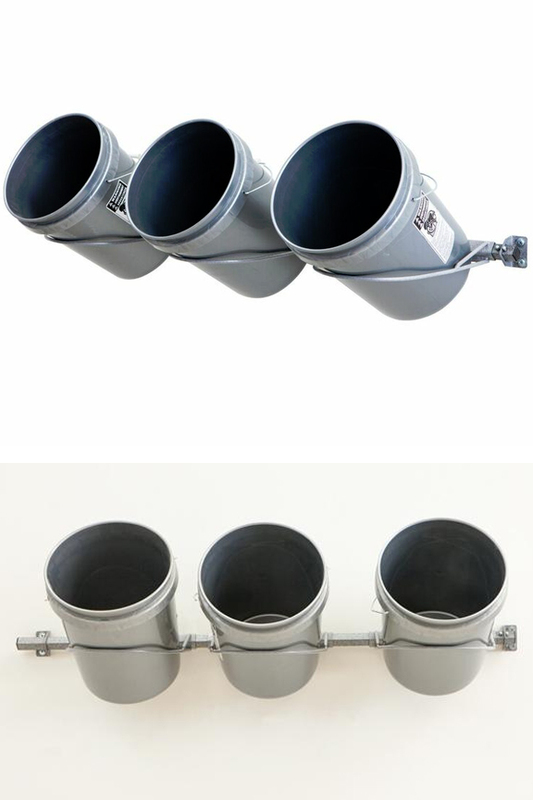 This sturdy rack mounts to any wall, and holds three five gallon buckets at the perfect angle. Toss in kids toys, organize hand tools, or keep all or your gardening supplies neatly and orderly. Once installed, you'll be able to store a ton of stuff in a compact space. Stop kicking things out of the way to find the stuff that's underneath, and don't pull your hair out trying to locate the right toy or supply. Use regular five gallon buckets to clean up the mess, and eliminate further frustration. Industrial strength steel is used to construct this rack, so it will remain sturdy and useful for a lifetime of service. You'll never have to worry about brackets that bend, or mounting hardware that fails, and you'll never have to deal with a storage device that loses functionality over time. Take just fifteen minutes to install it in the location you prefer, and then forget about it as everyone tosses in sports equipment, garden hoses, hammers or car detailing supplies on a daily basis. Things placed inside will be easy to take out, and everything stored will be found quickly when needed. Three large metal loops connect to the bar to hold standard size five gallon buckets. Buckets are not included, but any that you already have, or those readily available at home improvement stores will be fully compatible with this storage rack. Hang up to 3 buckets at once. Store any number of items, and pile in up to 200 pounds of stuff. A 35" bar mounts horizontally on your wall, and large, circular brackets attach in a perpendicular fashion. Each metal bracket is able to accept one five gallon bucket, and once inside, it will be held at the perfect angle for putting things in, taking things out, and seeing what's inside. There will be three bucket holders included, and each one can hold a single container, so you can store as many as three buckets full of stuff with each rack you hang. Tough. Way stronger than the flimsy competition, this commercial grade storage rack is made from industrial strength steel. It will be incredibly sturdy and long lasting, and it will hold up to 200 pounds without breaking a sweat. Don't settle for other options that only look the same. This one features unmatched strength and quality. Protected. The thick steel parts are already tough, but a powder coating takes it one step further to provide even more protection and strength. As an added bonus, it also gives this product a great look that doesn't fade over time. Compatible. You only get the rack when you purchase this storage solution, but it easily works with buckets you have at home, or ones available at local stores. Take any five gallon bucket, and slip it inside the circle to hold it on the wall securely. May work with other containers you have as well. Simple. A clever design results in few parts, easy instructions, and fast installation. This effective rack is simple to put up, and simple to use. There are no complicated parts to use, or long directions to follow. You will have it fully operational in a matter of minutes. Effective. Just set it up and forget about it. It will provide flawless functionality for a lifetime. Give yourself one of the best ways to small objects when not in use, and never worry about it failing over time. Lifetime Warranty. Thanks to superior materials and high quality construction, this storage rack comes with a lifetime warranty from the manufacturer. Gain piece of mind and long term confidence, and never worry about cheap parts, broken pieces or stuff that wears out over time. Uses Store small objects off the floor and out of the way. Fully compatible with a variety of objects. Perfect for use in the garage, attic, basement, shed or utility closet. Compatibility Hold up to 3 buckets at once. Works with any stuff that fits. Hooks Included Comes with 3 bucket holder brackets. Buckets Included No. None included. Works with standard, five gallon variety. Assembly Required Yes - Simple assembly required. May take up to 15 minutes to install. Get the clutter up off the floor, and make it easier to find the stuff you need. This clever storage solution is perfect for toys, tools, gardening supplies, sports equipment and more. Install in no time to eliminate messes and free up floor space, while organizing all of your junk. Order Yours Today! Rugged & Durable. All Steel Tool Storage by Monkey Bar Storage. A Sliding Tool Holder for Convenient Access Virtually Anywhere. 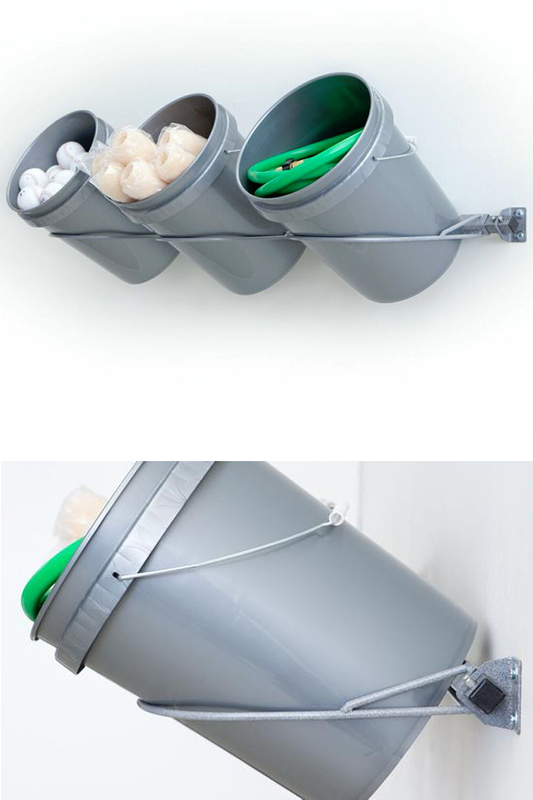 A Wall Mounted Storage Rack For Your Mops And Brooms. Organize With Ease! Cleaning Tool Holder and Organization Rack.